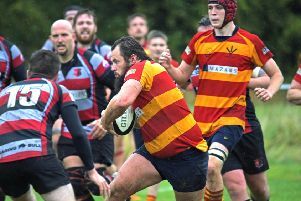 Stockwood Park were beaten 22-21 at Northampton Casuals in a tremendous Midlands Three East South clash on Saturday. The hosts were soon 7-0 up, slicing through Park’s defence after collecting a loose ball in midfield and then added to this with a penalty to make it 10-0. Park were then on the scoreboard themselves when, following forward pressure, centre Brandon Lewsey scored and converted a try. This was soon followed by left wing Kyran Ryan who outpaced the home defence to score near the posts, Lewsey’s boot making it 14-10 at half time. A yellow card for a professional foul robbed Park of Lewsey for 10 minutes at the start of the second half, with Casuals taking advantage to score again and move 15-14 in front. Stockwood continued to attack and had some quality lineout possession, where locks Phil Doherty, Jack Wharton and back row Michael Powell and Will Varnals excelled. 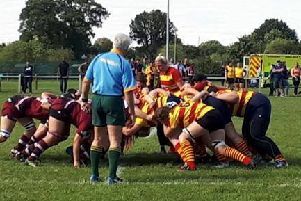 From such a lineout on the Casuals 22 metre line, Park produced a powerful drive which was stopped illegally on the home team’s try line and resulted in a penalty try to give the visitors a 21-15 lead. However, with just eight minutes to go pressure from Casuals resulted in their winning converted try to leave them as 22-21 victors. Park took much credit for their performance including a losing bonus point. They are back in action on Saturday, September 29 at home to seventh-placed Birstall. Park’s 2nd xv made it three wins out of three with a 34-22 victory over Albanians 3rd xv. There was also a win for the club’s 3rd xv as they defeated a Hitchin xv 27-7.